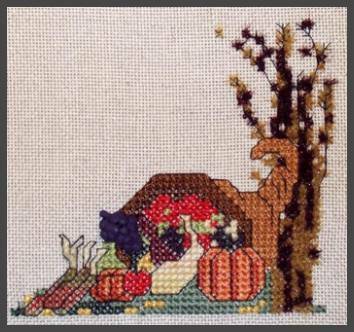 Thanksgiving Harvest is stitched on 18 ct Floba using Rainbow Tweed, Frosty Rays, Cresta 'd Oro, Perle Cotton #5, Fuzzy Stuff, Watercolors and Impressions. Kit includes fabric and fibers and 'grapes' button needed to complete this project. Separate chart pack includes chart and button. For extra buttons - click for buttons.